Following a heated presidential election in 2016, educators and advocacy groups observed a troubling phenomenon that became known as the “Trump effect.” On the campaign trail and beyond, President Donald Trump employed divisive rhetoric to appeal to his base — behavior, educators noted, that students mimicked to bully their peers. Now a new study published in the peer-reviewed journal Educational Researcher has grounded the issue in hard numbers. In Virginia, researchers found, school bullying incidents spiked after the election in counties where Trump was victorious while they remained stagnant in areas that Democratic challenger Hillary Clinton won. After the election, bullying rates among seventh- and eighth-grade students were 18 percent higher in localities that favored Trump, researchers found. Such students were also 9 percent more likely to report that their peers were teased because of their race or ethnicity. There wasn’t a meaningful difference in bullying rates between left- and right-leaning areas prior to 2016, according to the report, conducted by Dewey Cornell, an education professor at the University of Virginia, and Francis Huang, an associate professor of statistics, measurement, and evaluation in education at the University of Missouri. So is Trump to blame? That’s a question the report does not answer conclusively. Although the bullying spike in right-leaning corners of Virginia correlates with the presidential election, Cornell said, it’s more difficult to pinpoint whether the presidential election caused the change — though anecdotally, several reports have highlighted instances in which kids used Trump’s statements to target their peers. Nonetheless, Cornell called the findings troubling. To conduct the study, researchers examined statewide student surveys conducted in 2013, 2015, and 2017. The surveys asked students whether they had experienced bullying at school and whether their peers were teased for factors such as race or sexual orientation. Survey data were then compared against local election results, which varied widely in purple Virginia. Though 82 percent of residents voted for Trump in Virginia’s most Republican county, Hillary Clinton ultimately won in the commonwealth. While reported incidents of teasing based on race and ethnicity declined in Virginia districts that voted for Clinton, they spiked in areas where Trump prevailed. Teasing based on sexual orientation was higher in right-leaning areas in 2017, but it had also been more prevalent in those regions prior to the campaign. Although there’s little research exploring how national events like a presidential election affect student bullying, the report notes, there is evidence of a “trickle down” effect, suggesting it’s more likely the behavior of adults — such as parents — that is affecting children. Students could also be reacting to information from social media, Cornell said. “We know that kids emulate adults [and] we know that middle-school kids aren’t so deeply interested in the presidential elections,” Cornell said. Although it’s possible that some students acted inappropriately after exposure to one of Trump’s more divisive speeches, he said it’s more plausible that kids were influenced by the adults in their lives. It’s possible, he said, that students heard their elders using antagonizing rhetoric or that adults in certain areas could have become more lenient with children who engage in bullying behavior. Bullying comes with important implications for educators, the researchers note, because victims often experience a decline in school achievement, social-emotional difficulties, and a heightened risk of long-term mental health problems. Nationally, about one-fifth of students report experiencing bullying at school. Despite the spike in bullying incidents in right-leaning Virginia counties, the prevalence in bullying among high school students nationally didn’t change between 2015 and 2017, according to the Centers for Disease Control and Prevention. 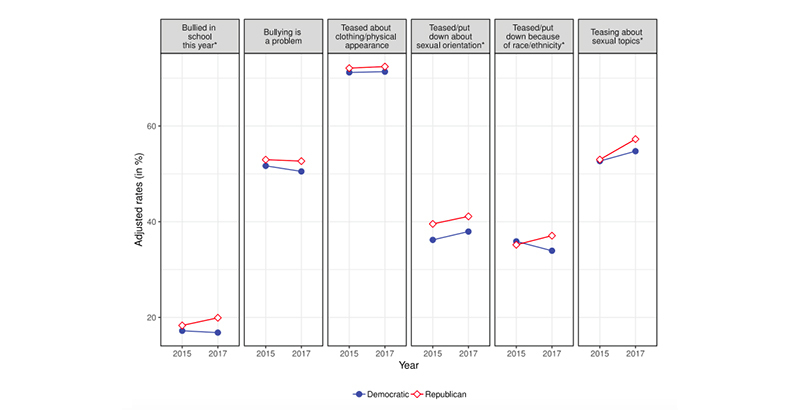 While that suggests that the overall national bullying rate wasn’t affected by the election, researchers noted, certain types of bullying could have increased while other forms decreased. Meanwhile, recent Federal Bureau of Investigation data show that reported hate crimes at K-12 schools and colleges surged by 25 percent in 2017. It was the second year in a row in which such incidents jumped up by roughly a quarter, though better reporting by law enforcement agencies likely contributed to the increase. As the state collects student survey results this spring, Cornell said he’ll be curious to see whether the trend continues. But for now, he urges educators to take the study findings seriously.